Following on from our post earlier this year from Julie, who was looking to change career and become a conservator and was on a work experience placement with us. In July as well as conservation students Fiona and Anna we had the pleasure of hosting work experience to Ruth, a student at a local high school. Ruth has very kindly written this post for us. My name is Ruth and I have just finished my first year of a-levels. I am really interested in textiles and wanted to find a work experience placement in that area. I sent a letter off to the National Trust Textile Conservation Studio, just down the road from where I live, and was overjoyed to get a placement there for eight days. Below is a small project that I did on needles and I was surprised there was so much I didn’t know! Embroidery needles – long eye which makes it easier to thread multiple embroidery threads as well as thicker yarns. Betweens or Quilting needles – have a small rounded eye. Used for making very fine stitches on heavy fabrics. Curved needles – Some of their uses include sewing awkward seams and are especially good for box making. They are also useful in textile conservation. Beading needles – very fine and have a narrow eye which allows them to fit through the center of beads and sequins. Chenille needles – similar to tapestry needles and are useful for ribbon embroidery. They have a large long eye and very sharp point. Tapestry needles – a large eye which allows them to carry a heavier weight yarn. Have a blunt tip which is usually bent at a slight angle from the rest of the needle. Self-couching stitch – used to secure torn, frayed or weak areas to a new support fabric. Quite a common stitch used in textile conservation. Worked parallel to either the warp or the weft. Support stitch – used to hold large textiles to a new backing fabric while distributing the weight of the thread evenly. Usually the support stitch is applied in a staggered pattern parallel to the warp. Herring-bone stitch – quite a simple interlacing stitch, similar to cross-stitch. It can be used to join two layers of fabric while maintaining flexibility. Also used to hold down single-fold hems or the edges of patches. Slip stitch –almost invisible on the right side. It is used for blind hemming and to attach linings to textiles. Whip stitch – used to join backing fabrics to main piece. When the fabric is opened up, a flat joint is created which avoids seam build up. Images taken from Canadian Conservation Institute website. 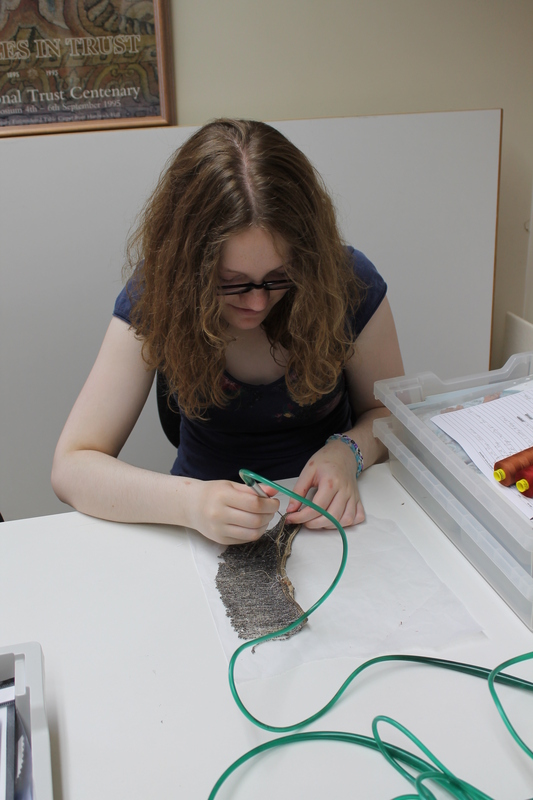 During my time there I was given a variety of tasks to do, including stitch exercises, labelling pieces from the Le Char de Triomphe tapestry from Castle Drogo, cleaning a rare lampshade from The Argory and I even got to help out with some of the tapestries too! I have really enjoyed my time at the studio and have learnt so much from this experience!